Make a dressing for the lettuce: whisk together 2 tbsp olive oil, 1 tsp essential Waitrose wholegrain mustard, the juice of ½ lemon and 1 tsp essential Waitrose honey. 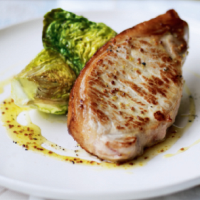 Heat the grill to high and cook 4 essential Waitrose British pork loin steaks for 6–7 minutes on each side, until cooked through. Halve 4 essential Waitrose little gem lettuces lengthways and brush the cut sides with 2 tsp olive oil. Place under the grill, cut-side up, and cook alongside the pork for the last 8 minutes, until golden. Serve the pork with the little gems, drizzled with the mustard dressing.